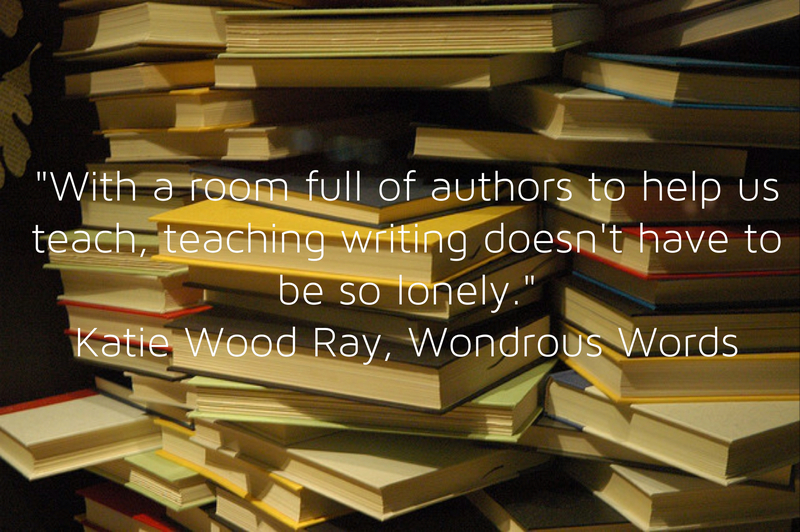 I didn’t know what it meant to read like a writer until I stumbled upon Teaching That Makes Sense. I love that site, and I printed out every pdf doc available, reading everything as I punched three holes and secured them in a big fat binder. Honestly, I do not remember half of all those helpful things, but I am grateful that the light finally dawned, and I realized that reading like a reader and reader, and reading like a writer, are not the same. How did I make it through my higher education and not know that? OR maybe I did, and I just didn’t flip the switch that made me realize the need to ‘pay attention’ and explicitly teach it to my students. I am sure the simplicity of TTMS helped. I thank Steve Peha for that. Reading like writers is the basis for analysis. I’d learned the importance of teaching students to analyze at the numerous Pre-AP workshops and AP Summer Institutes I’d attended. I’d never learned about how to teach students how to teach themselves how to analyze — quite simply by paying attention to how the author constructs meaning. Now, I teach my students to pay attention. As we read our self-selected books, we watch for the ways the author crafts meaning. We notice imagery and what it does for the author’s message. We notice figurative language that helps create this imagery. We might underline sentences that speak to us boldly or whisper to our souls. And we talk about how these elements create tone and theme. But more importantly, we talk about why these sentences speak to us as people. I agree. Now, when I read, I look for gold. I read because I love the story, but I also read to find beautiful language that I can share with my students. I project passages on the board that we read together. Sometimes we just read and enjoy the language. Sometimes we write a response to the meaning of the text. Sometimes we analyze the elements, talking about why the author used the device and how that device affects the meaning. Sometimes students model this language in their own writing. Most learn to pay attention as they read. Because once they get it, they are the ones projecting the passages they find, and sharing their own golden language. Every other Monday on this blog I will post examples of the types of texts I use in my class for craft studies. If you have your own favorite passages, some kind of gold you’ve found in your reading, please share in the comments. Sold by Patricia McCormick is incredible! Such a gold mine of poetic prose. She shows had to truly pack a punch with gorgeous language. Love your message here Amy! I am training myself to be a better writing-reader. Can’t wait to see the suggestions! Finally started The Sky is Everywhere last night. There’s more gold in that book than any I have read in a long time…and I’m on page 20! Already planning to use it! Thank you, Ruth. Being at Frost CPT was a life-changing experience for me, and you were a vibrant part of that. Blessings to you! I love the sentence, “When I read, I look for gold.” That is the crux, isn’t it? I LOVE this blog, thank you for being at Frost CPT so I could meet you and know about this wonderful community of teachers/learners and most importantly, true Educators. The caps ARE intentional.